Topaz T-LBK750 SigLite 4x3 LCD - Dual Serial & HID USB, Backlit, SE, Z-T-LBK750-SEBH. 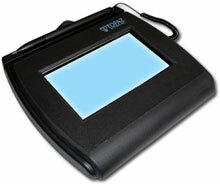 SigLite LCD 4x3 includes all the high-quality electronic signature capture features of Topaz signature pads with the added feature of an LCD interactive display allowing users to see "electronic ink" under the pen tip as they sign as well as navigate and display text and graphics. The large signing area and the touch-sensitive surface provide excellent price-performance characteristics and long life. Signature Pad Stand, swivel/tilt design, compact and economical solution for securing your Signature pads to any flat surface. Battery, Replacement, 2 Pack, Compatible with Topaz T-S261, S-S751, T-C912, T-C916. Pen, Tethered, Includes Non-Removable Pen Tip and Mini-Plug Connector that Plugs Directly into the Jack in the Back of the Signature Pad, Compatible with Topaz SignatureGem LCD 1x5. The Topaz T-LBK750SE-BHSB-R is also known as Topaz Systems	T-LBK750SE-BHSB-R	or TLBK750SEBHSBR	.